Walmart is suing Visa because it wants to require customers using new debit cards to enter a PIN when making a purchase. The retailer charges in the suit that Visa's policy to allow people to enter signatures at the register leads to more fraud. It also argues that the strategy is a bid by the payment processor to grab higher fees on debit purchases. In-store payments that are authorized via signature are routed across Visa's debit network and generate higher fees for the credit card company. Walmart (WMT) argues that its data shows that 91% of fraudulent debit card purchases are done with signatures. "PIN verification is much more secure than signature verification," said the lawsuit, filed in New York state court. "It also enables Walmart to route transactions across PIN debit networks rather than signature debit networks, which saves Walmart (and its customers) money." Visa (V) did not respond to a request for comment. Walmart's suit also says that debit cards account for 70% of all card purchases at the store. While it wants to require PIN's for debit purchases, it does not require a PIN for credit card transaction. The chip cards themselves were introduced to try to cut down on fraud, and are much more secure than the traditional magnetic strip cards. The U.S. trails many other countries, especially in Europe, in adopting the chip cards. Walmart's suit says many of those countries now require both chips and PIN codes to make a card purchase. Its executives have been very critical of the way the U.S. has adopted the new technology because it still allows signature purchases. Mike Cook, Walmart's assistant treasurer and a senior vice president, said last year that using the chips without the PIN's "is such a joke." It makes sense for Walmart to fight for the greatest possible use of PIN codes, said Jeremy Gumbley of Creditcall, which helps merchants upgrade their credit card systems. 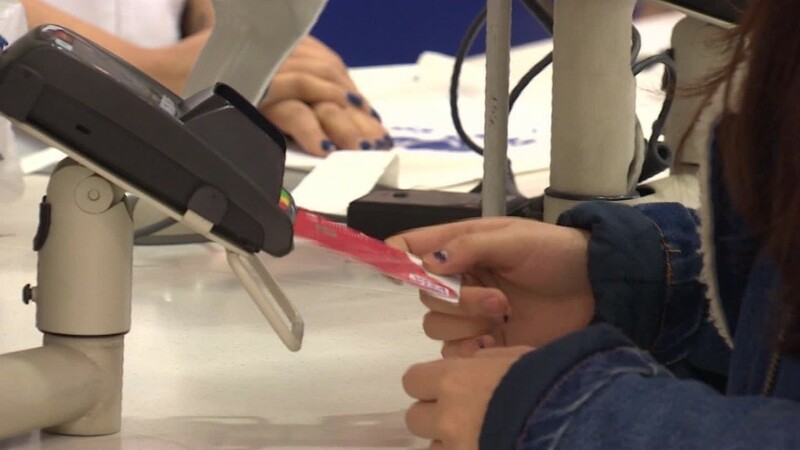 He said allowing signatures "does little to protect consumers from would-be thieves using lost or stolen cards," while at the same time raising costs for the retailer. "For a retailer the size of Walmart, this could cost it dearly, and all the while its consumers receive only part of the protection [chip cards] can offer. Not exactly a win-win for either party," he said.